You'll notice that this Blu-ray Disc has a comparatively short running time. 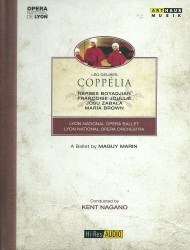 The explanation is that this particular performance of Coppélia confines itself to the first two Acts of Delibes's most popular ballet. It’s worth noting, however, that the decision to jettison Act 3's wedding festivities is not without precedent. The superb BBC television version of 1957 starring Nadia Nerina, Donald Britton and Robert Helpmann (ICA Classics ICAD 5058, see here) was similarly abbreviated, as was a joyously exuberant 2001 production from the students of the Paris Opera Ballet Dance School headed by Charline Giezendanner and Mathieu Ganio, characterfully supported by Pierre Lacotte as Dr Coppélius (TDK DV-BLCOP). However, the loss of Act 3's resolution has wider implications than simply leaving the final outcome of Swanilda's rocky romance with flighty Franz undetermined. Concluding the ballet at the end of the second Act, in which the doddery, elderly Coppélius has been cruelly teased and meanly tricked, changes its overall final tone completely. Faced with such questionable moral conduct from our supposed heroine, we are left not with happy smiles on our faces at the triumph of love over adversity, but with a distinctly bitter-sweet taste in our mouths. The abbreviated running time is, however, just the first of this production's distinguishing characteristics. Most strikingly, rather than being set in the expected rural backwater of a 19th century Galician village, here we find ourselves in a contemporary Lyon banlieue. The whole first Act is filmed on its real streets and, if you're a fan of the cult French TV crime series Spiral, you'll know what to expect – or, at least, what such fictional dramatisations might lead you to expect: a bleak environment of concrete apartment blocks, populated by feral gang members whose chief amusement seems to be intimidating the other residents and whose idea of an entertaining night out is hurling abuse and throwing rocks at Coppélius's windows. Dressed in authentic looking grunge, they can be pretty menacing, even when safely confined behind your TV screen. The opening of the well-known czardas, when, rather than breaking into the expected spirited dance, they stand stock still for a few moments gazing threateningly en masse at the camera, is such a moment in point. Not only has the ballet's setting been altered, but so, too, have key elements of the story itself. Any changes in Act 1, set on those mean urban streets, remain relatively minor. However, the action in the second Act, set in the apartment of Monsieur - no longer "Dr" - Coppélius, isn't much accordance with the traditional story, even though it's left unclear as to which bits are supposedly "real" and which might simply be fantasies in drunken Franz’s mind. True enough, Coppélius has a life-like doll on the premises but more significantly, he also has a ciné projector which shows endless film loops of her. Eventually that doll-on-film emerges from the screen and replicates herself into twenty or so identically dressed lookalikes that include the Lyon company's dragged-up men as well as its women. Add to that the forced debagging of Franz and Coppélius, a speaking doll who delivers some recycled old Mae West jokes about guns in pockets and a whole gang of automatons escaping onto Lyon's streets and you'll get something of the flavour of this wacky, but rather endearing, take on an old favourite. Maguy Marin's choreography predictably and appropriately eschews strictly classical style. It is characterised by energy, excitement and occasional quirkiness, while remaining both very well drilled and often surprisingly elegant. While the members of the corps de ballet - even the en travesti men - dance with complete conviction, there are also winning individual performances from Françoise Joullié and Josu Zabala, though, whenever together, their Swanilda and Franz never make an especially convincing couple. Indeed, the former's alternately gruff and sulky moods made it easy to see why her boyfriend might be tempted to play the field, if only with a doll. The Lyon National Opera Orchestra gives a fine, straightforward account of Delibes's jaunty score under the direction of Kent Nagano, their music director from 1988 until 1998. Arthaus Musik makes great claims for the disc's "Hi-Res Audio", claiming that it provides "the pure sound experience of studio master tapes, available digitally for the first time in their uncompressed form". The reproduction of the film's original soundtrack is certainly very good indeed. So too is the up-scaled picture quality that offers an entirely acceptable image throughout and is especially impressive in Act 1's outdoor settings. The release comes packaged in something approaching a thin hardback book that, being a little larger than standard Blu-ray packaging, may appear somewhat out of place alongside other discs on the shelves of MusicWeb International’s more style-conscious readers. While diehard fans of the traditional Coppélia may find this version somewhat tough going, it is certainly an intriguing one that throws up all sorts of new ideas. As such, I'm pleased to be adding it to my collection.